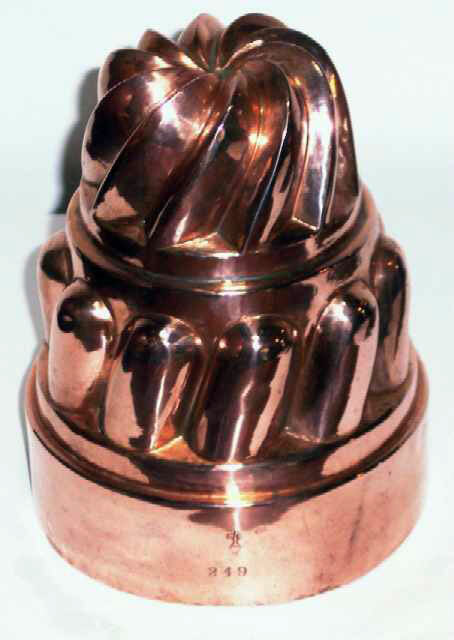 Antique English Three- Tiered Copper Mold, c. 1870's, Benhams & Froud, #249. The mold has the Orb & Cross Mark that was used as their tradmark from @1855. The Orb and Cross which they used as their mark was taken from the Orb and Cross that sits atop St. Paul's Cathedral which they made in 1821. The one on the Cathedral weighs 7 tonnes and stands 23 feet high. The mold is 6-1/2" high and 5" in diameter and is in excellent condition.